The latest fragrance release from luxury footwear brand Jimmy Choo is Illicit, a "modern floriental" developed by perfumer Anne Flipo. Illicit's notes include ginger, bitter orange, rose, jasmine, honey-amber accord and sandalwood; its ad campaign is fronted by singer, model and actress Sky Ferreira. I'm probably not the target customer for this perfume: I covet shoes from John Fluevog more than anything from Choo, Manolo Blahnik, Christian Louboutin et. al., and I don't know anything about Sky Ferreira. According to Sandra Choi, Jimmy Choo’s creative director, "Illicit embodies the daring spirit of the Jimmy Choo woman. She is alluring, hypnotic and lives her life to the full. "1 I don't think any of this applies to me, either (alas). Still, I do like the Illicit bottle very much — it's a nicely weighted clear glass cylinder with vertical ridging that recalls Art Deco crystal (see below) — and I like Anne Flipo's work, so I decided to give Illicit a try. What did I think? Well, it didn't cause me to dive daringly and hypnotically into the ocean while wearing my fanciest silver sandals (like Ms. Ferreira in the Illicit ad), but it's good fun. Speaking with Elle UK about Illicit, Anne Flipo said, "I imagined a remarkable yet audacious fragrance, with a tempting signature. That's why I decided to lay down a fizzy start and floral heart on a unique honey-amber structure." That last part sounds right. Illicit opens like a champagne cocktail with ginger syrup and a twist of orange. Its heart is all pink sugar-dusted roses. And its base, with that "honey-amber" accord, turns Illicit into a floral-gourmand (fleurmand!) rather than a floriental. Illicit's dry down does have a warm drizzle of honey, but it also reminds me of Jordan almonds and vanilla cake. The Illicit press kit included a macaron nestled in actual flower petals — a perfect analogy for this fragrance. I'll admit that I haven't tried every fragrance release from this brand. I did test the original Jimmy Choo scent, a musky fruitchouli that didn't leave much of an impression on me, and I've sniffed Blossom, a sweet berry-floral in a hot-pink bottle. Even if Illicit isn't particularly "remarkable" or "audacious," I find it more enjoyable than its older siblings. I bet it will even outsell them if it can push its way through the crowd of fall releases and find its stiletto-wearing audience. 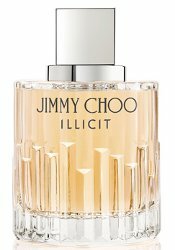 Jimmy Choo Illicit is available in 40 ($65), 60 ($85) and 100 ($112) ml Eau de Parfum. 1. Via Jimmy Choo at Facebook. Ha, it would be interesting if they made a perfume as outrageous as the shoes. There’s so often that gap between the fashion and the fragrances, right?! I thought of this, too late: Illicit reminds me of Gucci’s Guilty. Not in the way it smells, but in the discrepancy between the edgy, daring, etc. image and the actual (pretty) fragrance. Yes, it’s interesting, isn’t it? It seems like fashions and fragrances were more in sync in previous decades, maybe. With the fad for super clean/super light fragrances going on and on and on, maybe they think anything that actually smells like anything (even if it is a honey cupcake) and lasts longer the 20 minutes is daring…. That said, I do like the bottle, as well. It does have good staying power, incidentally! and you’re right, it’s all relative. My tastes tend to lean a little gourmand, so I think this looks pleasant enough to try, for sure. The nice bottle helps, too. Any idea what the distribution is going to be? Hi, Sapphire — it will be available at some of the major dept stores — Nordstrom, Macy’s Dillard’s, et al. … plus Sephora, so you should have a chance to sniff it soon! Jessica, you are not alluring and hypnotic and you don’t live your life to the full? Shame on you! I know, I know… I need to work on this! Well never mine – you can fake it by getting a Jimmy Choo Illicit perfume, for only $60!!! I really like the original Jimmy Choo, Stars and Exotic. I have been waiting for this Illicit to come out, and smelled it today at Macys. Actually I drenched myself in it. I definitely smelled the ginger and the honey. I thought it was pleasant smelling, it just couldn’t hold my attention. It’s definitely pleasant, and I like the ginger and the honey! While this sounds pleasant enough, I’m not in any kind of hurry to try it out. Now the John Fluevog shoes! OMG OMG OMG! I just took a look at those. And I want a pair something awful! Oh no, I’ve created Fluevog cravings! Have fun looking!! You should try it! It’s easy to wear and it’s not too heavy. I am another Fluevog fan. Not only are they cute and quirky, but comfortable ! Hurray! I refuse to own shoes that are not comfortable and I love Fluevog’s retro/goth look. I just wanted to say…. Fluuuuevogs! I love Fluevogs, my first pair of expensive shoes were Angels, bought when I was sixteen. I currently own three pairs of Fluevog high heels – Opera Malibrans, Mini Q-Tee sandals and Nicos – and I love them all. John is Canada’s gift to the world. When he makes a signature perfume, THAT I want to smell. I love my pair of Fluevog heels. There’s no other brand like this one! Now I’m really glad I mentioned it. A Fluevog scent!! — that would be amazing. Let’s hold out for Fluevog Illicit – now that would be a statement scent! I own one pair of Fluevogs, and have *almost* owned six – over a couple of seasons. Since I discovered them, I always drool through the window pane when I go to the US on my annual work-related trip. I own a very old pair of Fluevog Angel shoes and a much more recent pair of Fluevog heels that I bought when I started a new job. I’m always coveting more. Fortunately, they hold up so well that even one or two pairs gives years of enjoyment! I am wistfully cheering from the Fluevog sidelines. I have big bear cub feet. Wide in the front and narrow in the heel. I am afraid Fluevogs run a little narrow but it is ok. I rock my cowboy boots, Doc Martens and Birks! I was just looking at the DM site — I love that new “Willow” pattern in blue and white! !